New ‘hubs’ based at live construction sites will train up thousands of workers and help tackle skills shortages in the construction industry, Education Secretary Damian Hinds announced today (16 November). Twenty six innovative partnerships across the country have won a share of the £22 million Construction Skills Fund to set up the new ‘hubs’ which will train more than 17,000 people to be job and site-ready by March 2020. The winning projects, including Southwark Construction Skills Centre in South London and Liverpool Waters Construction Hub in the North West, have collectively committed to training up over 7,000 people into permanent jobs by the end of the programme. With an estimated 158,000 new construction workers needed in the UK over the next five years, the scheme will help create the skilled workers to meet this challenge. "It is vital that we have a strong workforce post-Brexit. The Construction Skills Fund will ensure more people gain the skills they need to forge a successful career and help create the skilled workers we need to deliver on our housing ambitions. "Today I’m pleased to announce the 26 winning projects that will train up thousands of workers and help tackle the skills shortages in the construction industry. To support this drive further we are transforming technical education including introducing a brand new T Level in construction, a high-quality technical qualification which will be rolled out from 2020. "Whether building new homes or contributing to major infrastructure projects to keep our country connected, working in construction means helping to shape Britain in the months and years ahead." All the ‘hubs’ will be based at live construction sites so trainees learn in a real-world construction environment and gain the practical skills they need to secure a rewarding career in construction. 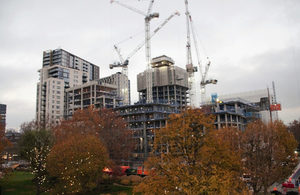 According to the latest statistics, over 222,000 new homes were delivered in 2017 to 2018 demonstrating that the government is on track to deliver 300,000 new homes a year by the mid-2020s. The training ‘hubs’ will help deliver on that promise and provide a skills boost for the construction and housing industry. "We can’t build the homes our communities need without a dedicated and skilled construction workforce. "Our Construction Skills Fund will play a crucial role in training the future labourers required to build more, better and faster homes." The Construction Skills Fund will help inform the design of the National Retraining Scheme, which the Chancellor recently announced will be backed by £100m. This ambitious programme to drive adult learning and retraining forms a part of the Government’s modern Industrial Strategy – a long-term plan to build a Britain fit for the future by helping businesses create jobs in every part of the UK. The scheme is funded by the Department for Education and is being delivered by the Construction Industry Training Board (CITB). "The Construction Skills Fund can be a genuine game-changer for both the construction industry and the individuals being trained. We have a massive need for homegrown talent and these projects will bring thousands of new people into our sector, giving them the crucial onsite experience they need to start a career in construction. These 26 hubs will be based at some of the most innovative sites in the UK, and CITB will be working hard to make sure they deliver the skills our industry critically needs."